Rene Robles, a 2008 member of the Boston Crusaders, submitted this photo and caption. This photo was taken at the Winter Guard International Tampa Power Regional at the University of Tampa in Florida. It truly was a GIANT reunion. 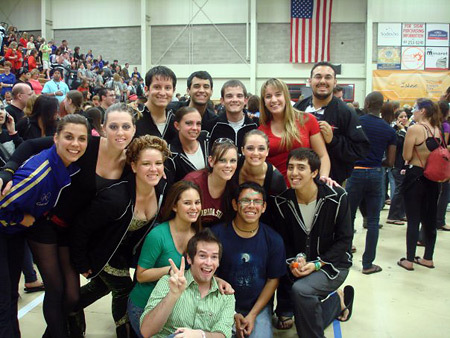 All of us in the photo marched as members of the Boston Crusaders color guard in 2008, and in addition to the 15 pictured here, there were another seven corps and staff members who were at this event! That's literally half of the Boston Crusaders color guard! In the photo: Alex Welch, Lauren Manville, Sam Swan, David Rojas, Manny Gandia, Derrich Alfred, Adriana Crespo, Rene Robles, Kristin Kornikowski, Amber Brown, Helen Stein, Sasha Ortiz, Mikey Labrada, Steven Martinez, Frankie Vadillo.